And how you can make the most of human nature to boost conversion rates and sales online. It’s 12 chapters (plus an introduction and conclusion). It's a beast. I’ll add links after each section so you can come back to the table of contents at any time. And there's a dropdown menu in the nav bar above so you can move between chapters whenever you like. This guide will walk you through the mind of your online traffic. You’ll get information that will help you improve the performance of your website at all levels, including optimizing your landing pages, your business tone, your website design and your funnels. It’s all backed up not only by academic journals and reputable sources, but case studies and quotes from the most successful marketers and UX designers out there. Want more Conversion Rate Optimization? Take my course on "Psychological Factors That Influence Purchase Decisions" on Highbrow today! In short, economics (and online marketing in general) is based on the assumption that people are rational beings who make buying decisions rationally. Instead, we make conversion decisions based on a thousand influential factors which seem to go against rational thought. This guide will discuss the most influential of those psychological factors. Firstly, you’re paying serious money (either through direct budget or investment of time) to drive traffic to your site. A higher conversion rate on that site gives you a better return on your investment (also known as ROI). More bang for your buck, so to speak. It’s better to convert more of your existing traffic than it is to attract more of it (particularly because you can always invest in top-of-funnel optimization once your site is optimized). The easiest decision to make is no decision at all. Procrastination isn’t so prevalent because it’s fun or habit-forming. Procrastination is so prevalent because it’s easy. 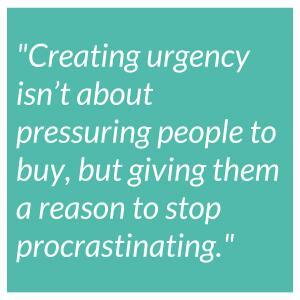 Creating urgency within your website and landing pages isn’t about pressuring people to make the purchase. Rather, it’s about giving people a reason to stop procrastinating. By giving your website traffic a rational reason for why they should convert now (instead of putting it off), you address their primary reason for not acting: laziness. What do people say when you ask them what they would do if they had 24 hours left on earth...? So it’s pretty clear that we’re influenced, heavily, by the amount of time we have to take action on something. Thus, limiting the amount of time that a possibility exists will seriously impact the likelihood of your prospective customers taking the opportunity. In a 2006 study, MarketingExperiments offered a $100 saving on the full price of their service for anyone who registered and paid before two specific deadlines. The offers were promoted towards the bottom of the page within the sign-up box (rather than emblazoned across their top banner). The offers were also sent out in an email on the morning of the deadline. That’s a 992.68% average increase in registrations for the 3 days before each deadline. Promote your email-gated content with limited-time bonuses (like templates, checklists, etc) attached. Lucia Savadori found, in no uncertain terms, that an item’s subjective value (or, the value a person ascribes to an object based on their perception, rather than the external world) increases when it is perceived as being scarce. 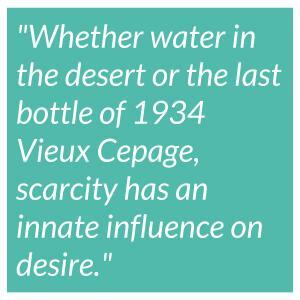 Whether you’re talking about fruit on the African savannah or one of the remaining bottles of 1934 Vieux Cepage, rarity and scarcity have an instinctive influence on desire. Anybody who’s ever bought a plane ticket online has likely been influenced (or, more likely, frustrated) by the limitation on available seats. Even if you recognize they’re probably straight-up lying to you, it doesn’t stop your heart from beating a bit faster when choosing your flight. 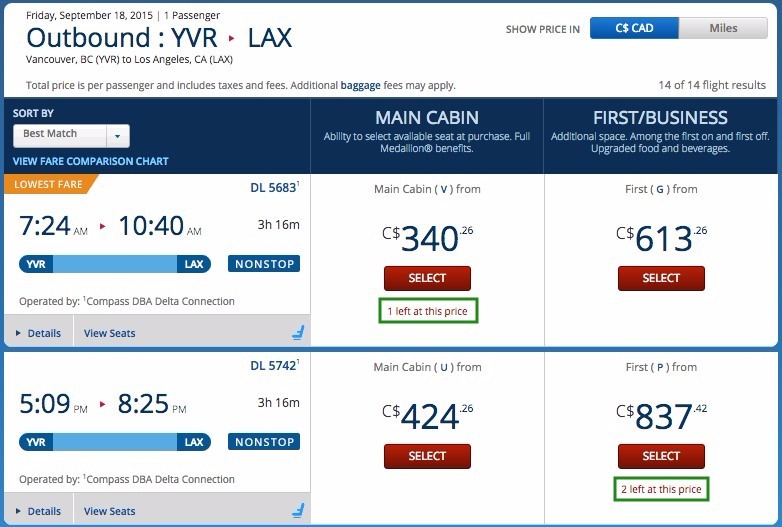 The example below from Delta.com uses scarcity of resources to create urgency to get you to buy a plane ticket right away. As you can see in a couple places below, two of their four ticket options read “1 (or two) left at this price.” If the visitor to this website wants this price they’re going to have to book before it’s gone (or at least, that’s the way it feels). Add a “limited seating available” notice at your conferences as well as your webinars. Add a “Only “X” left!” notice within your e-commerce product pages.